The definition of taking a break is interrupting one’s activity briefly. When I went into hiatus the end of October I didn’t expect it to be over two months before I would come back to blogging. I was touched by the people who reached out to me while I was missing in action. Several messaged me directly to find out if all was well. From my young 3C1R Luella who I’ve known nearly two decades to my #1 reader/commenter/blogger Amy to my follower from Brazil whose ancestors lived in the same village as my ancestors. All were worried. They didn’t know I’d fallen into a rabbit hole, spinning down winding double helix strands carrying our DNA. It took me a while to gain my orientation and find the even more twisted ladder out of the hole. 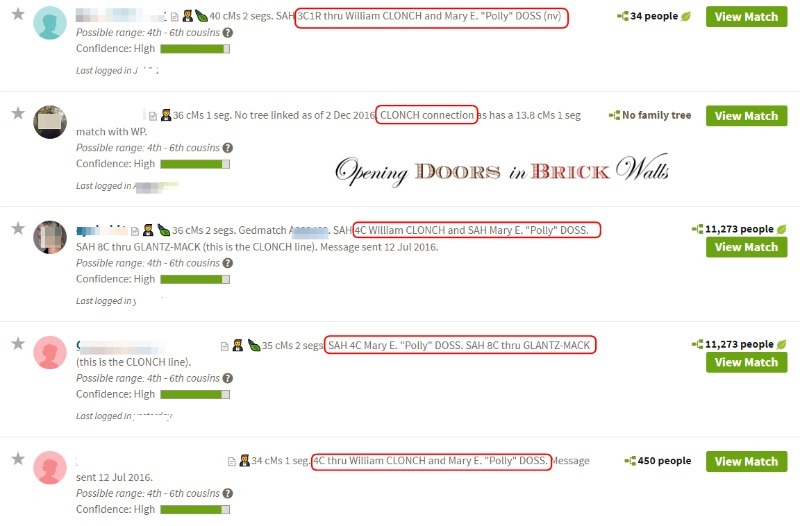 Blaine T. Bettinger shared my post How DNA Results Helped Discover Luxembourg Emigrants in the Facebook group Genetic Genealogy Tips & Techniques. Great blog post about how the DNA Match Labeling extension for Chrome helped solve a genealogical mystery! Genetic networks and clustering tools are the future of DNA evidence! I had no idea I was even on Blaine’s radar and it explained a spike in traffic on my blog during the week following the post. Being noticed by Blaine was fantastic. Even more incredible was the help I received from a member of the Genetic Genealogy Tips & Techniques group. 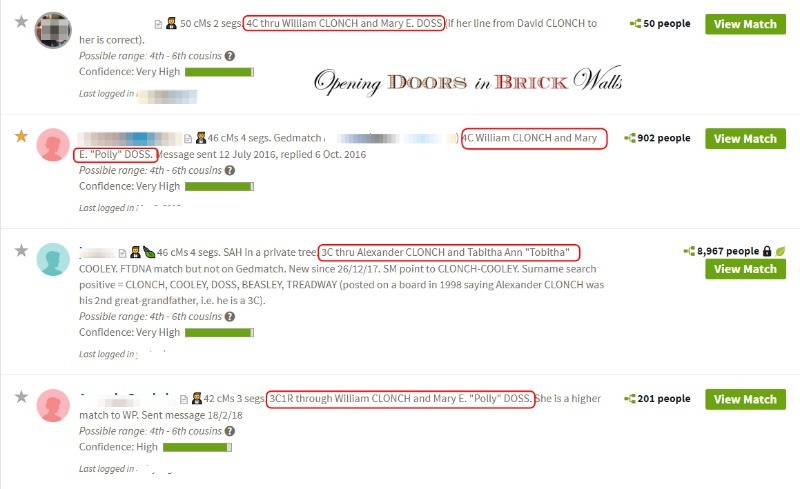 Jonathan Brecher sent a message offering to run a Shared Clustering tool he has developed on the AncestryDNA test I manage to help me tickle out the maternal matches. As mentioned in the above post [over two months ago] maternal matches are few and far between as that side of my family tree is Luxembourgish with a few branches which reach into France and Germany during the periods of time when the area belonged to Luxembourg. Jonathan’s tool is not yet available to the public. He sent a CSV file with the heat map of my matches and a list of the clusters in text format. He paid special attention to my starred matches as these were the ones I had already been able to identify as maternal. 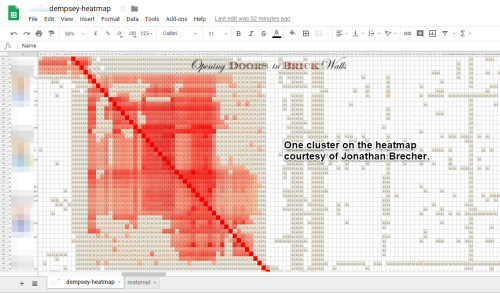 The heat map generated 66 clusters. Four of these are for maternal matches while 61 are for paternal. One cluster remains unknown at this time but looks more paternal than maternal. The number of matches in each cluster varies greatly. There are a dozen clusters with only 2-10 matches, 33 between 11-100, 11 between 101-200, 4 between 201-400, 5 between 401-500, and one with 705! I pinned down the fourth maternal cluster this past week – when I was supposed to be working on this post. I felt the pull of that rabbit hole, again, and checked each match and their trees until I found the connection. 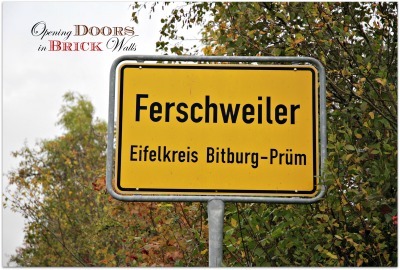 They descend from immigrants, two BAUSTERT brothers who were great-grandsons of my 5th great-grandparents Matthias SCHRAMEN and Anna Barbara LEIBRICH (BURG) of Ferschweiler, Eifelkreis Bitburg-Prüm, Rheinland-Pfalz, Germany. Did the Baustert brothers know their 1C1R Nicholas SCHRAMEN had emigrated about 20 years earlier and originally settled in Iowa where they were also found? 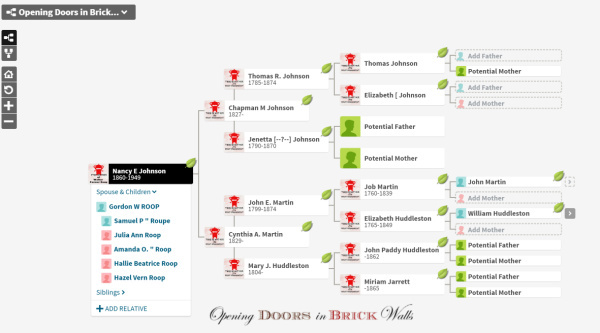 As the CSV file Jonathan sent included my notes, the paternal clusters were easily identified as coming from one of the four paternal grandparents’ branches. Some could even be associated with specific branches of a grandparent’s ancestral line. I’ve been amending my notes on AncestryDNA to reflect the cluster number as well as a surname and possible generation. The cluster numbers are only for reference and make it easier to sort them on the AncestryDNA page using the Chrome extension AncestryDNA Helper or in Genome Mate Pro when sorting the MRCA (most recent common ancestors) notes. Cluster 40 with 13 matches is labeled GROELINGER-MERGEN(6) as the MRCA have been identified as my 4th great-grandparents (6 generations back) Johann GROELINGER and Anna Maria Benedikta MERGEN. Six of the 13 matches have been identified as descendants of this couple. I’ve sent messages and am waiting for replies. 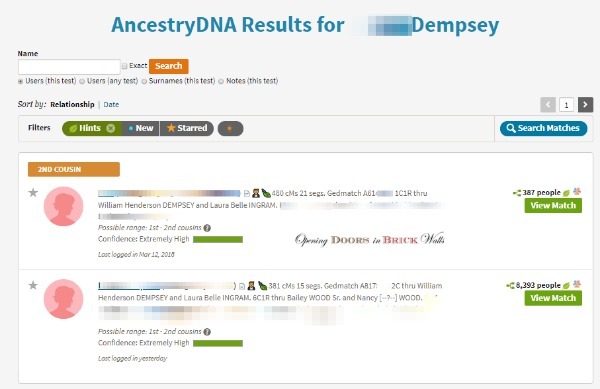 Once the notes have been fixed on AncestryDNA, I move all matches for a cluster over to Genome Mate Pro (GMP) using another Chrome extension, Pedigree Thief (collects the match information, notes, and the shared matches). When the matches are in GMP, I begin adding the matches’ trees once again with the Pedigree Thief which reads the pedigree view of the tree and converts it to an Ahnentafel chart. GMP has a very steep learning curve and I’m still trying to assimilate and grasp the abilities of the program. I’ve developed a routine and am slowly getting matches which have been associated with a cluster entered into GMP. Nearly half of the clusters, the smallest, have been added. The larger clusters remain to be done and I’ll be spacing them out a bit. And of course, as new matches are found on Gedmatch Genesis, FTDNA, and MyHeritage they are also added to Genome Mate Pro. I still feel the pull of the rabbit hole but I won’t let it get in the way of my returning to a regular blogging schedule. Thanks for reaching out, Cathy. Unfortunately we are experiencing a delay in Shared Ancestor Hints and DNA Circles populating currently. It is taking several weeks for hints and circles to calculate, but we are working on fixing that so it happens much faster. We are very sorry for the inconvenience in the meantime! While we are working on a fix, please let us know if anything changes on your end or you come across any other issues! Why did my AncestryDNA Circles go missing? I know it takes a while for Shared Ancestor Hints and DNA Circles to appear when you link a tree to your AncestryDNA test. There are many different reasons why they don’t show up or why they disappear. In my case, I knew they should be there and they simply weren’t. Personally, I thought a delay in Shared Ancestor Hints and DNA Circles populating was caused by users who changed their trees too often. 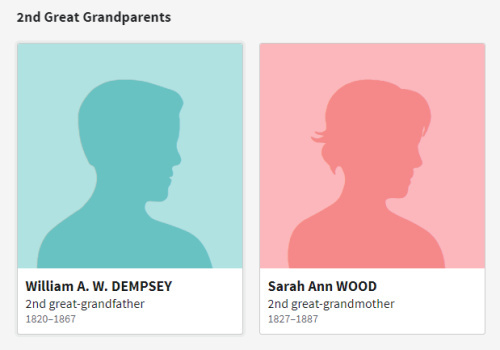 How much data can Ancestry handle? I’ve had two different trees attached to the test I manage since June 2016. The first was for only direct ancestors. The second was my full tree and I had linked it in November 2017 in hopes of hearing from more matches. Between Christmas and the New Year while doing location comparisons I noticed an anomaly. People born in Luxembourg were showing up in Utah and a Maryland born person was in Bermuda. 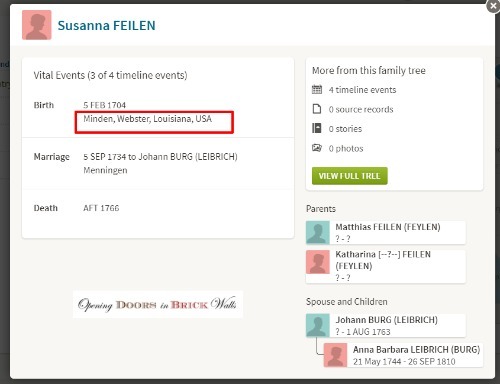 My Susanna FEILEN, born in Germany, was showing up in Louisiana. This sent up a red flag as I don’t have any ancestors born in Utah, Lousiana, or Bermuda. 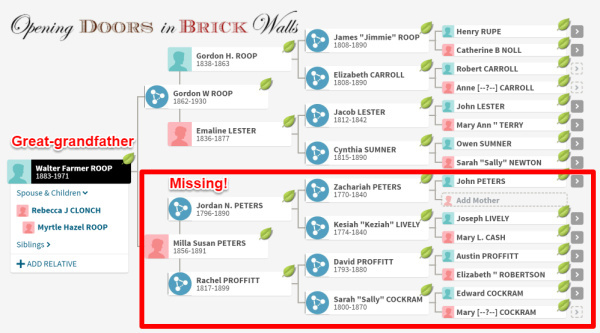 This is how Susanna FEILEN’s birth location is in my tree on Ancestry. The places were entered correctly in my tree however on the DNA page they were not the place they should be. 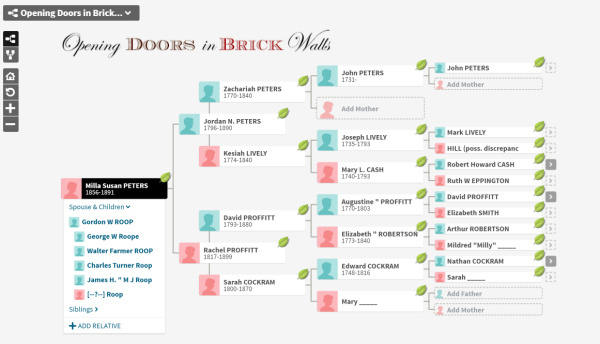 This is how Susanna’s birthplace was seen in my tree on the AncestryDNA page. This meant matches were seeing incorrect information in my tree. How could matches take me seriously when there was such a mess showing in the tree linked to the DNA test I manage? Half of our ancestors were born in Europe and many of these were showing up as born in the USA. I suspect (in my opinion) Ancestry was using some kind of location identifier which converted places when the tree was linked to the DNA test. Hoping it was only a glitch on the AncestryDNA site, I waited a few weeks for it to fix itself. That didn’t happen and in mid-January, I decided to go back to the original tree with only direct ancestors. This fixed the location problem. While my Shared Ancestors Hints remained the same, my DNA Circles, previously between 28-30, disappeared. I knew by linking a new tree I would reset Shared Ancestor Hints and DNA Circles. It would take a few days for things to get back to normal. I waited and waited. A month after I linked the tree I still did not have DNA Circles. That’s when I reached out to Ancestry the first time and was told about the delay. Three weeks later the DNA Circles were still missing and I wrote several more messages to Ancestry. Shared Ancestor Hints were still growing and the missing Circles were taking far too long, in my opinion, to populate. I suspected my tree was just stuck in some kind of never-never-land and asked if perhaps by linking it again the problem might be solved. We’re very sorry for the delay Cathy. We do not advise to unlink and relink your tree since this will remove any shared ancestor hints and it may take time to populate them again (if they are following all the requirements). At this point, I was not a happy Ancestry client. I knew other people were complaining and I let Ancestry know my dissatisfaction. I was given a free month’s subscription to be taken when I wish. This is appreciated but I would much rather have my Circles back. Our developers are aware of issues with the DNA circles and are working to get them out of beta. Until such time, there will be irregularities with their behavior. We apologize for this and ask for your patience and understanding. 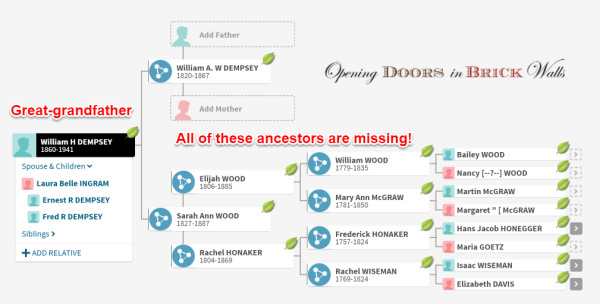 Earlier this month I went through each of my Shared Ancestor Hints and added the information to the Notes available for matches. I added SAH and the information about the relationship and the ancestor. I also included an emoji leaf 🍃. At the same time, I also added emojis for paternal 🤵 and maternal 👰 matches. My patience had run out. I was preparing to do what Ancestry said I should NOT do. 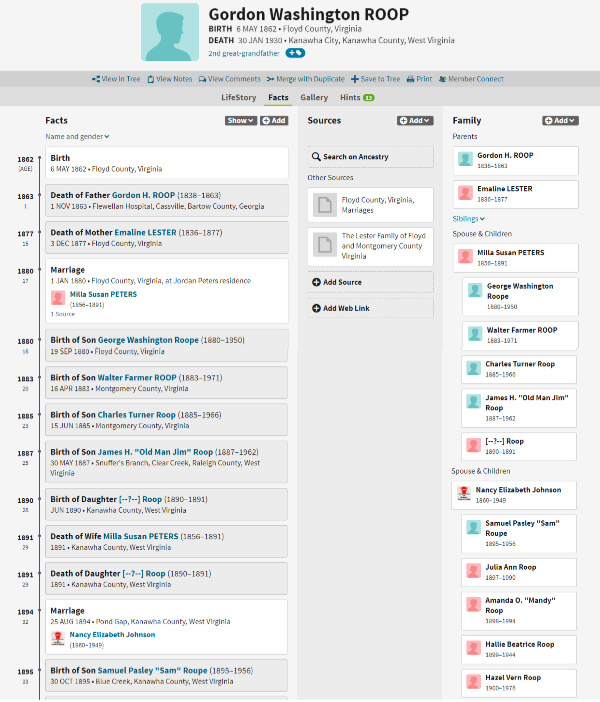 I finished adding notes to all of the 412 matches with Shared Ancestry Hints on Thursday evening. Then I went into Settings and clicked on the X to unlink the tree. I waited 3 seconds and linked the same tree again. Over the weekend I did not have time to check on AncestryDNA. On Monday morning I found 23 DNA Circles! My re-linking the same tree triggered the change I was hoping for. My DNA Circles are back after nearly three months and my Shared Ancestor Hints did not disappear. Nine new ones came in over the weekend when they normally just trickle in one at a time. 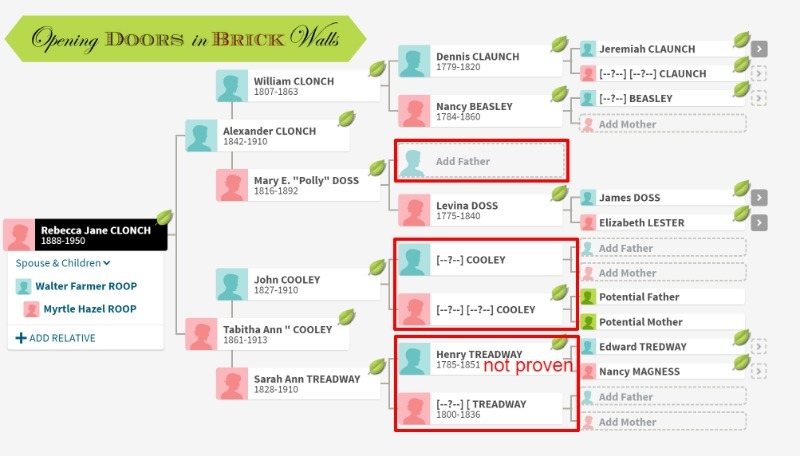 Please take note that Ancestry does not recommend unlinking and linking your tree again. I took the chance and it worked. 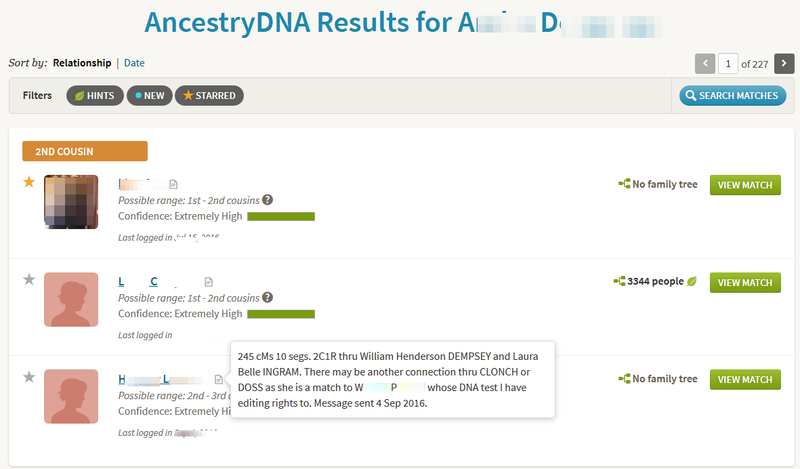 Perhaps Ancestry got the problem fixed at the same time I risked losing my Shared Ancestor Hints in favor of the DNA Circles. Now I am going to go in and tag all of the matches who are in the Circles and make a note of the people who are in the Circles but don’t share DNA with the test I manage. Just in case they disappear again. If it were not for Amy Johnson Crow and her 52 Ancestors in 52 Weeks Challenge I may not have started blogging in 2014. During my first year, I wrote about my American ancestors on the paternal side of my family tree. In 2015 I wrote about my children’s European ancestors, from their grandparents to their 4th great-grandparents and continued with their 5th great-grandparents in 2017. In my last post, I finished the endeavor just in time to celebrate my 4th Blogiversary. Four years! Sometimes it seems like yesterday and then it feels like I’ve been blogging forever. 2017 A Year in Review and What’s Coming in 2018 took care of the statistics for the past year but I left my readers hanging with the What’s Coming in 2018 question. Although the majority of my articles have been about the ancestors, visitors to my blog have been interested in other content. Top posts show people are being drawn to my blog for the how-to posts: DNA and FamilySearch. My About page, which I hope everyone visits, was updated in November 2017. James SIMS is on the list twice and – his son-in-law William JOHNSON Jr. just made it into the top 10. What projects do I have for 2018? The Slave Name Roll Project posts will continue in 2018. The Old Photographs Saved from Trash Can series came to an end after the last nine posts in January through March 2017. A final post, a synopsis of the family connections made during the process of writing about each of the over 150 photos was pushed off to the back burner but not forgotten. I want to get this done during the year. I have this mind mapping idea to show the connections using text and images but still working on the how to do it. 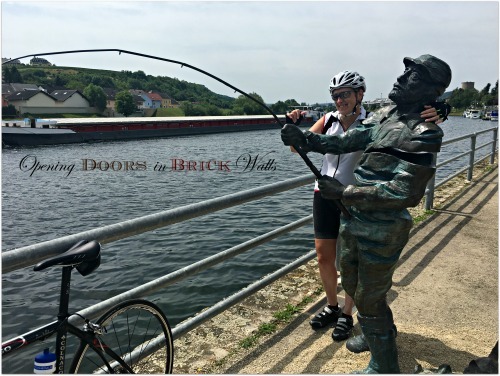 A New Look for Opening Doors in Brick Walls in December 2016 brought a fresher look to my blog. Unfortunately, with all the research for the posts in 2017, I did not find the time to go through and fix formatting which didn’t conform to the new theme. I want to go through the old posts, fix images (too large, not centered), add footnotes to early work, add Genealogy Sketch boxes to the ancestors’ stories, and fix links in earlier posts. I am always linking back to older posts but sometimes forget old posts can also be linked forward to new content. I’m hoping to come up with a few ideas for future posts when I check and fix the older posts. 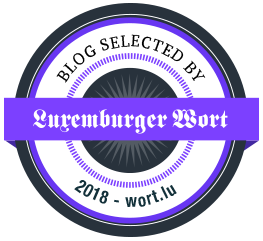 In my last post 52 Ancestors: #47 Michel Trausch and Catharina Hames of Mamer I started using Markdown to format footnotes. This is going to be a real timesaver in future posts. I plan to go back and re-do the ones in previous posts. I’ve managed my brother’s DNA on Ancestry for a little over a year and a half. I’m not in the league with the genetic genealogists but I think I’m grasping it better by reading as much as possible. For the past six months a few hours a week, I’ve been setting up profiles and importing chromosome data to Genome Mate Pro. Going slow and getting it done right the first time. 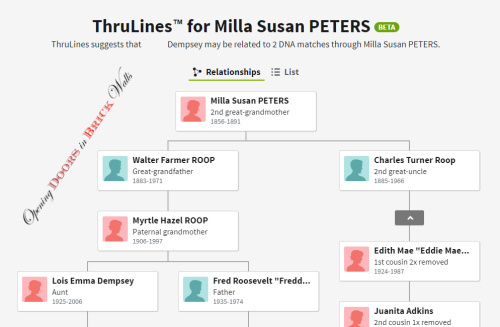 So far it looks like the family tree data is matching up with the DNA results. I’m still waiting to make an earth-shattering discovery in my tree – and not in someone else’s. Why is it so easy to see the connection when it’s not your own tree? I’m not committing but I hope there will be a few DNA discoveries I can write about during the year. For nearly 18 years the SIMS family has fascinated me. I worked with a group of SIMS descendants in 2001-2002 per email. Everyone shared their information, photos, and documents. The result was the biography of James SIMS, Pioneer of Nicholas County, (West) Virginia, written in early 2002 with a revision in 2013. The original version has been attached to hundreds of trees on Ancestry.com. James SIMS was the only child of Jeremiah SIMS of Culpeper County, Virginia. Many family historians have tried to prove the parents of Jeremiah were Thomas SIMS and Rebecca PETTY. But not Rose Mary Sims Rudy, one of the original members of the SIMS research group, who sent me 25 pounds of books and papers several years ago. It’s time to go through the research material to see what may have been overlooked. It’s also time to lay out and test a hypothesis Rose Mary shared with me concerning the ancestry of Jeremiah SIMS. This should get me through the year. Thank you to all my followers for the visits, views, likes, and encouraging comments that motivate me to continue. Author Cathy Meder-DempseyPosted on January 23, 2018 Categories UncategorizedTags AncestryDNA, Blogiversary, DNA, Evergreen, Sims, Top 1032 Comments on Fourth Blogiversary! 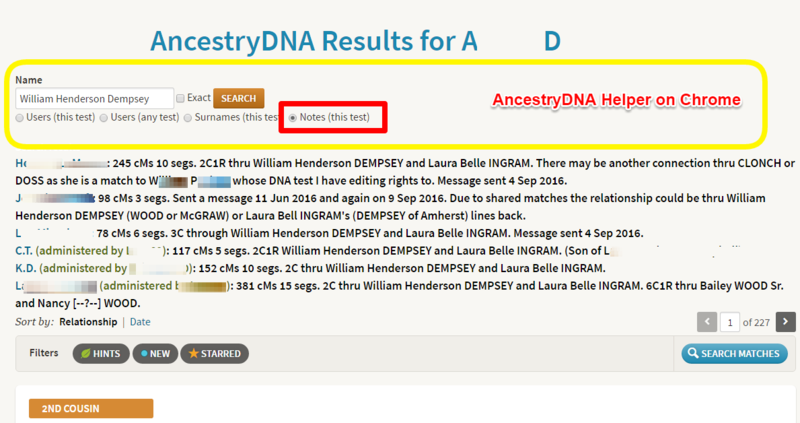 Last week I wrote about the six things I include in the notes on AncestryDNA for each of my brother’s DNA matches. 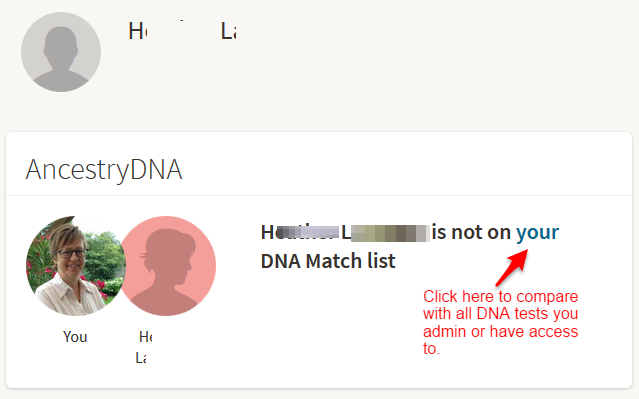 With matches for hundreds of 4th cousins or closer and thousands of distant cousins on AncestryDNA, I needed a simple but efficient method of working through and sorting his matches. As you can imagine I don’t have notes for every match. There are so many matches with no trees attached and I have become choosy about which ones I add notes to. Close matches and shared matches have priority. When I’m on the results page or viewing shared matches I click on the notes icon to open up the information I have on the match. There is no need to go through several clicks to get to the information as described in my post last week. When I’m viewing Shared Matches and they don’t have notes, I take a moment to add the cMs/segs and the other 5 things I add to notes when accessible. The extension has a feature which allows you to search for users, surnames, and notes. I use it to manage my notes. For sorting through my DNA matches, in Chrome, I click on View all Matches. 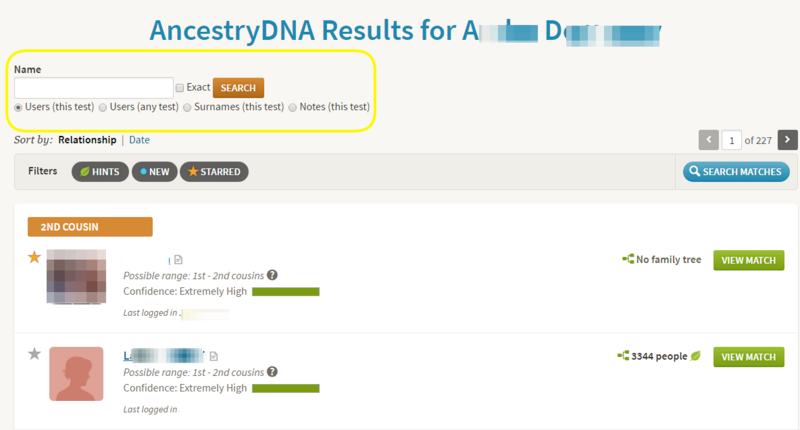 The search box feature (circled in yellow above), found above Ancestry’s filters for Hints, New, and Starred, is what I use search the text in all notes. In this example, the search feature generated a complete list of all notes which include the name William Henderson Dempsey. I can search for surnames in the notes, messages sent, or kit numbers. When I search for the term cMs a complete list of all matches with notes is generated. This is the consistency I mentioned in my post last week. Each match has different notes but cMs is the one word which is used in all notes. 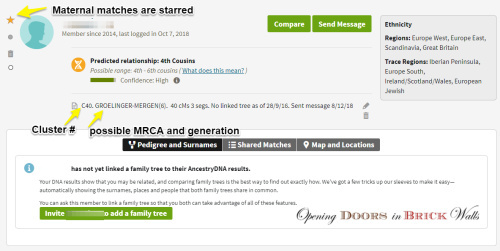 The success rate of contacting matches through Ancestry’s message service has been low for me! I would like for people who share DNA with my brother to upload their raw DNA to GEDmatch so that I can use the tools on the site to compare the results. While I wait, this is the method I use for working through and sorting my brother’s DNA matches. How are you sorting through your DNA matches? Have you been more successful getting replies to messages? Please leave a comment below. I would appreciate your feedback. Thanks! 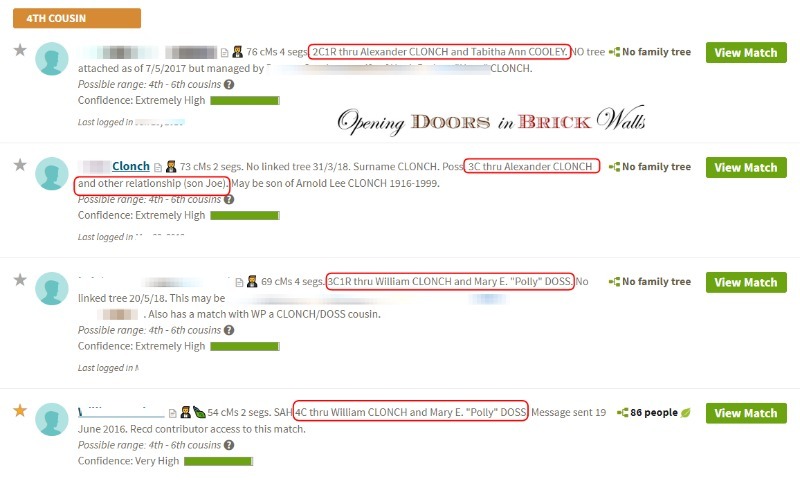 With matches for hundreds of 4th cousins or closer and thousands of distant cousins on AncestryDNA, I needed a simple but efficient method of working through and sorting my brother’s DNA matches. A spreadsheet in Excel was not an option as I wanted something I could refer to while on site. 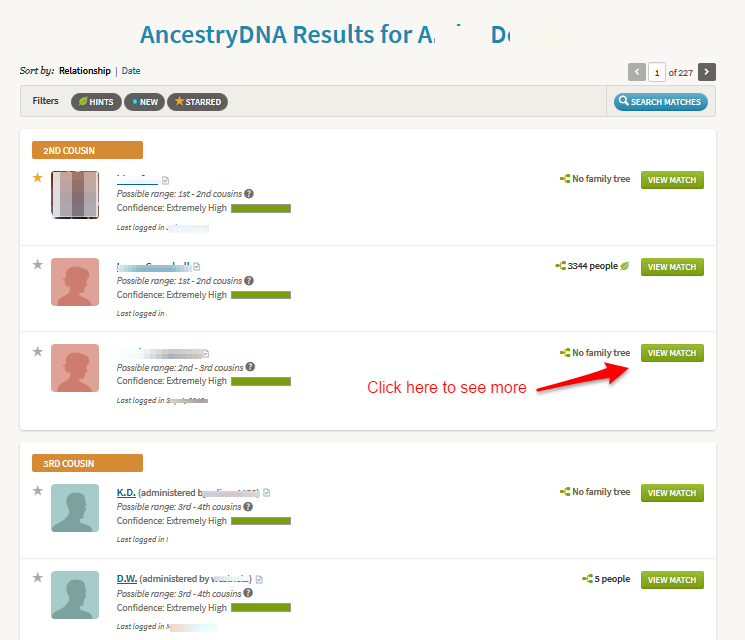 To find out more about an AncestryDNA match you have to click on View Match. AncestryDNA Results for my brother A.D. This takes you to a new page with your match’s name, ethnicity, predicted relationship, and DNA Circle connections (when available) at the top. To see the amount of Shared DNA you click on the little i. At this point, to avoid having to repeatedly go through these extra clicks, I add the following information to Add note. The note, limited to 500 characters, can be added to each match. The first item I include is the amount of shared DNA. I shorten “245 centimorgans shared across 10 DNA segments” to “245 cMs 10 segs.” Consistency is important as will be seen in my follow-up post next week. If I can determine the relationship to the match I add, for example, 2C1R instead of 2nd cousin once removed, and the common ancestor(s). In this example, H.L. had a public tree (not a tree attached to her DNA) with 7 people. By checking the Shared Matches and the tiny tree I was able to figure out the relationship. 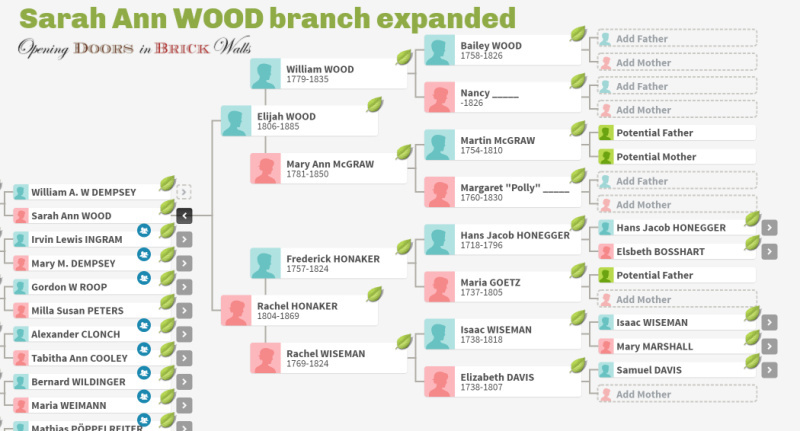 There were 51 shared matches – two 2nd cousins, three 3rd cousins, and 46 4th cousins. Many had scanty trees, no family trees, or private trees. 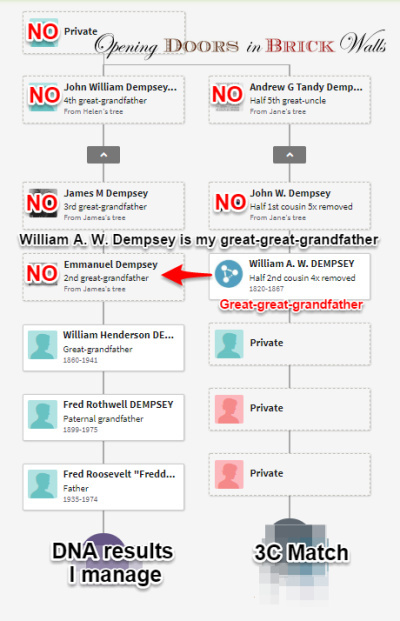 The top shared matches suggested a Dempsey connection, a name seen for 2 of the 7 persons in H.L.’s tree. I administer my brother’s DNA results and have access and editing rights to a more distant cousin’s DNA. He is in the 5th-8th cousins range and does not show up on the Shared Matches which is only available to the 4th cousin level. 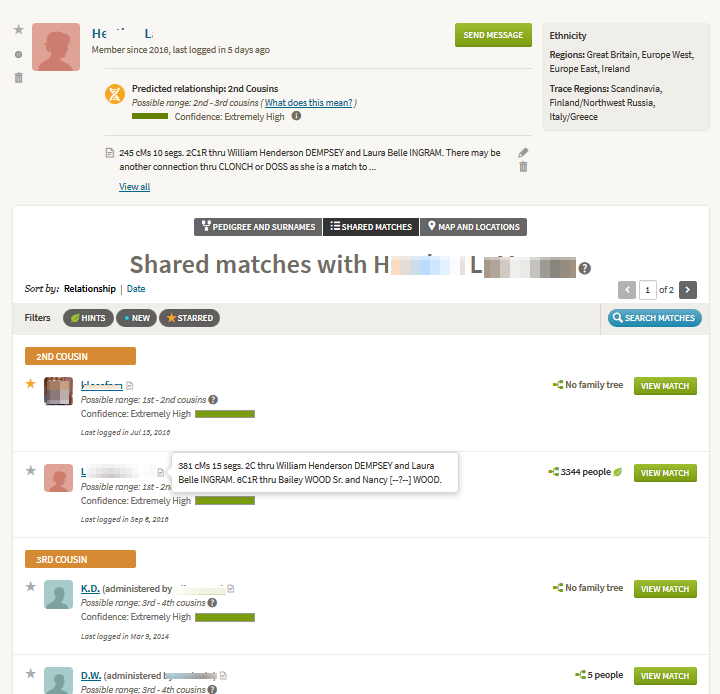 Ancestry has a feature which shows matches to tests you administer or have editing rights to. Click on the match’s name to View Member Profile. Below the profile photo and description is a box titled AncestryDNA. I have not had my DNA tested and therefore this person is not on my DNA Match list. But when I click on your the two tests I have rights to can be checked. Surprisingly, in this example, both tests I admin are matches to H.L. This does not mean all three match the same ancestor. I add to the note that there is possibly another connection. My brother’s match to H.L. may include DNA from our paternal grandmother’s side through the CLONCH or DOSS lines as well as DNA from our paternal grandfather’s side. When I contact a match I include the date the message was sent in the note. As replies or queries come in I note the date a message is received. If a match doesn’t have a tree or it is private, I make a note of this with the date viewed. This way if a tree is added later I will know it hasn’t been checked. 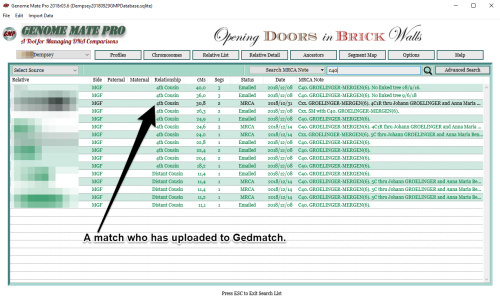 If the match has shared his/her name, GEDmatch and/or FamilyTreeDna kit numbers, I include these in the note. Feel free to leave a comment below with your favorite use of the notes feature. What information do you include in your notes on AncestryDNA? Next week I’ll share how I use the notes on AncestryDNA and how I manage them.